With the amount of data being stored each day, it has become crucial to find a way to enhance storage and reliability, while still limiting costs. A blockchain is a first answer to this issue by being a decentralised system allowing for data storage. They were first introduced by Satochi Nakamoto’s White Paper “Bitcoin: A Peer-to-Peer Electronic Cash System” in 2008. Because the data is not centralised, it is easier to maintain and an update can be sent to the entire system through propagation. Additionally, because it is distributed, there is good recoverability. Backups become irrelevant as there are already multiple copies of the systems on different machines. The data cannot be tampered with as mathematics functions or digital signatures are applied on it. This means that users cannot lie on the data or its provenance. This also results in enhanced security through the cryptography used. Moreover, because the system is distributed, there is no single point of attack for any malicious individual. There are different kinds of blockchains, they can permissioned, where access is required meaning that only certain users will have access to certain pieces of the system. They can also be permissioned-less, where all the data is accessible to everyone since it is stored in blocks of the chain – and the chain is public. 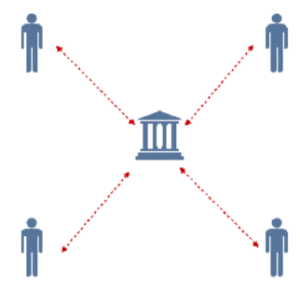 In a system such as Bitcoin, all the transactions are public, only the identities of the users are anonymised. Through the chain, the data is traceable – from its creator to the different users. This leads to an almost perfectly transparent system. 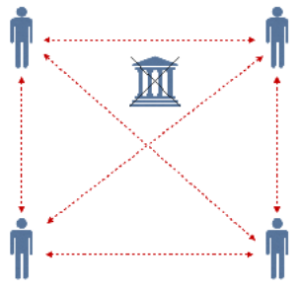 The blockchain theoretically works like this: When individual A wants to send a message to B, it is signed with its private key, making it easy to determine its public key and hence the identity of the sender. Indeed, it is easy to compute a public key from a private key whereas it is not the other way around. This message is then sent to the network, where all the nodes (actors) present will ensure that the private key is was sent with actually corresponds to the person it claims to be from. Once this is confirmed, the message is added as a block in the chain of all the previous messages. This leads to ensuring the sender of the transaction is whom she/he says is as well as making sure that one can temper with the data since it has been signed and added to the blockchain. In simpler terms: Individual A wants to send an update to the system while having it recorded so no tempering can be done with the data without an evidence of it being changed. The message is stored on a blockchain and the system is updated. Everyone now has access to it. Without blockchain there is a central database, a single point for updates and the integrity of the system is managed by a central authority. With blockchain there is a distributed database, the system ensures that no error is updated by using consensus mechanisms and the integrity is managed by the blockchain itself.